Notre Dame wide receiver Javon McKinley, 20, is reportedly facing two charges of misdemeanor battery and one count of misdemeanor underage drinking. TMZ Sports reported the news, noting the charges stem from a Sunday morning arrest. 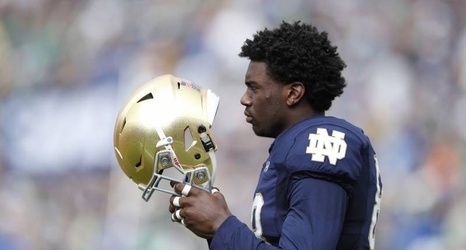 According to the report, Notre Dame University Police officers tried to help McKinley to his dorm after he passed out in the back of a car, but he allegedly punched the two officers—one male and one female—during the walk. He was taken into custody after attempting to flee and is due to be arraignedin court Tuesday. Notre Dame football player Javon McKinley was arrested early Sunday morning for battery and resisting law enforcement.